 In Unequal Treatment, Nechas and Foley (Women's Encyclopedea of Health and Emotional Healing, not reviewed) argue that bias against women in medical research and practice has had a detrimental, often deadly, effect on women's health. 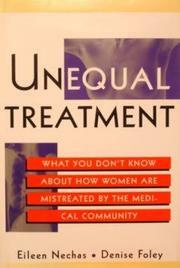 The authors compile shocking examples of medicine's neglect of women. AIDS and heart-disease research have focused almost entirely on men, even though women are the fastest-growing group to be afflicted with AIDS and coronary heart disease is the leading killer of women. Breast cancer research, until recently, received dramatically less funding than AIDS research, despite the fact that breast cancer kills approximately twice as many people. Nechas and Foley have compiled solid statistics and well-selected examples to make their case. Unfortunately, their prose sometimes undermines their convincing, well-organized evidence. They frequently obscure their arguments with clumsy metaphors, lapsing into phrases like ``conflicts between the biomedical and sociocultural views of illness swirl together to produce a pernicious brew.'' They also condescend to the reader at points (as the subtitle might suggest), launching into unnecessary polemics where their facts speak for themselves; epithets like ``the macho world of medical research,'' for example, seem extraneous given that the book has clearly established that gender bias in medicine exists. Yet when Nechas and Foley attempt to write in a chatty and accessible manner, they often end up being unsatisfyingly vague or inaccurate. For instance, when they tell us that in the 1980s, abortion was kept legal ``by some miracle,'' they ignore an important history of pro- choice organizing. Despite stylistic flaws, a valuable resource on the politics of women's health.